Today I start on the first page in my 5-year diary again! 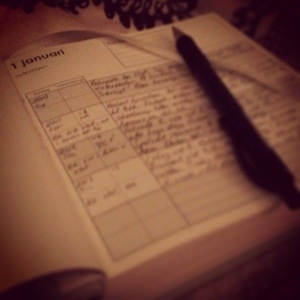 2013 will be my 4th year that I write in the diary. I bring it with me everywhere when I’m staying more than one night. During the past year its been with me to Spain, Madeira, London, Crete, and to Linköping of course! In the diary I keep track of what I’ve been doing each day such as any specific event/dinner party, major worldwide events happening, the weather and most importantly how my RA is doing. It’s very valuable to be able to easily go back and see how I felt during the same period the previous year. I’ve learned what months I feel fine and which are not as good. I’ve learned what weather really make my joints act up etc. It’s also fun to easily see what happened the same date the previous years. It’s always something special going back to page one and starting the book all over again. What fun (and not so fun) things will I write about this year?